"Which One ~ Nyo?" (ドッチ～ニョ？) is the fifth ending theme to Pocket Monsters Diamond & Pearl. Used in episodes DP 146 - DP ??? 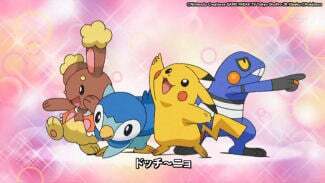 CD('s) found on: TV Animation Pocket Monsters Diamond & Pearl New Ending Theme "Which One ~ Nyo?" Atchi ~ no kotchi ~ no dotchi ~ na no? Datchu ~ no guratche ~ no kangae-chuu na no? "Miyaburu ni ~ kagi wakeru ~" tte chigai wakaru? Magirrawashi yayakkoshii demo tanoshii desho! Pokemon GET shite Chanpion Roodo! Aoi Karanakushi dotchi no umi? Hoohoo no ashi wa sayuu dotchi? Dotchi ~ nyo kyou wa dotchi da? Dotchi ~ nyo ue ka na shita ka na? Dotchi ~ nyo hidari ka migi ka na? That one or this one? Which one? Which one ~ nyo? Which one nyo? Which one which one which one ~ nyo? Do you know the difference between and "sniffing out" and "sniffing"? But it's also fun, right? Which ocean can you find the blue Karanakushi? Which one of Hoho's feet is the left one and which is the right one? Which one ~ nyo? Beadle or Beedle? Which one ~ nyo? Lapras or Lovecus? Which one ~ nyo? Mankey or Manmoo? Which one ~ nyo? Hassamu or Handsome? Which one ~ nyo? Which one is it today? Which one ~ nyo? Up or down? Which one ~ nyo? Left or right? Which one ~ nyo? Which one ~ nyo? 1I really have no idea what this part is supposed to mean. If any of you have any ideas, please let me know. 2The Japanese word for chitosan is kitosan. If you rearrange the letters, you can spell Tosakinto, aka Goldeen's Japanese name. 3In this part of the song, the names of pokemon whose names are only a syllable or two different are contrasted. In a lot of the cases, the comparisons are easier to see when looking at the straight-up romanizations rather than the spellings I use for this site (i.e. Hassamu vs. Hansamu (Handsome)).